Chuma Katungu is 9 years old; she lost both her parents when she was 4 years old. Chuma is being kept by her Grandmother who does not work. The grand mother could not send her to school.In 2010 she was listed among the girls to be sponsored by Academic work of Sweden. 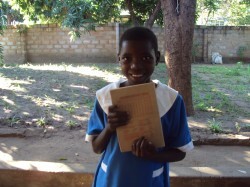 With the support of Academic Work, Chuma is now in school and she is a very happy child now.